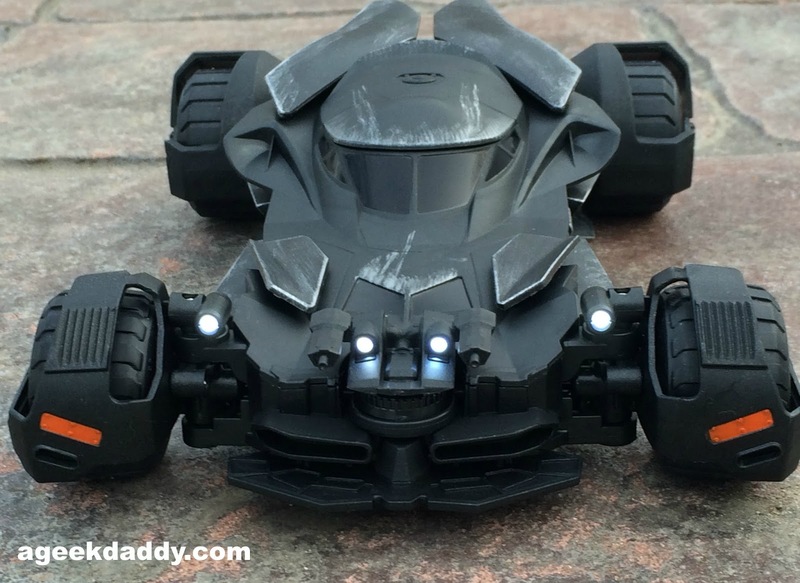 My kids have had a blast playing with the AIR HOGS Batman V Superman: Dawn of Justice Official Movie Replica Remote Control Batmobile that Spin Master sent us for A Geek Daddy toy review; but I have to admit I've probably even had more fun than they have playing with this really great RC vehicle. 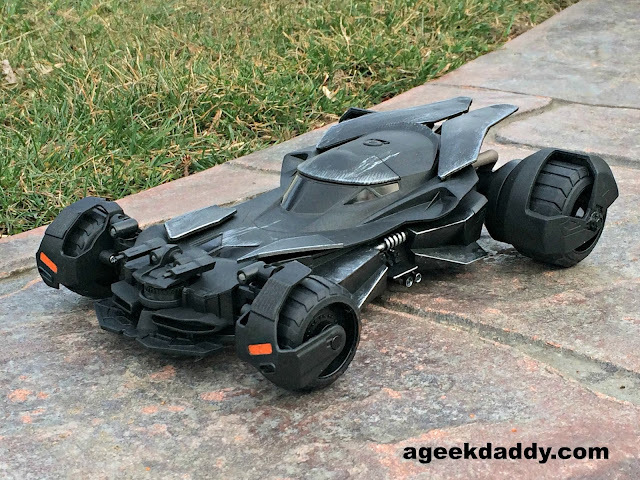 We've raced the batmobile indoors across our hardwood floors and carpet, took it for a spin around our back yard leaping it off our back patio, and took a trek through grass and mud at the local playground with it. Not only can the vehicle dart around at a nice pace but it is very durable as it took several crashes into curbs, trees and other miscellaneous hazards without breaking while we were playing around with it. This is a toy that I see both myself and my kids enjoying for a lot of hours well after A Geek Daddy's wrapped up reviewing it. The AIR HOGS Batman V. Superman Official Movie Replica Remote Control Batmobile gets A Geek Daddy nod of approval because it comes packaged with a sturdy remote control that does an excellent job syncing with the vehicle allowing kids to easily steer it, provides a USB rechargeable battery that holds a long charge so you don't have to constantly power it up or replace batteries, was durable enough to take all the abuse my 7 year old twins could throw at it and keep on going, and has a cool looking appearance to it that no matter what your age will let you enjoy pretending to be Batman racing through the streets of Gotham City. Kids, or kids at heart, who are fans of comic books and super heroes will want to get their hands on this awesome RC Batmobile from Spin Master Toys. 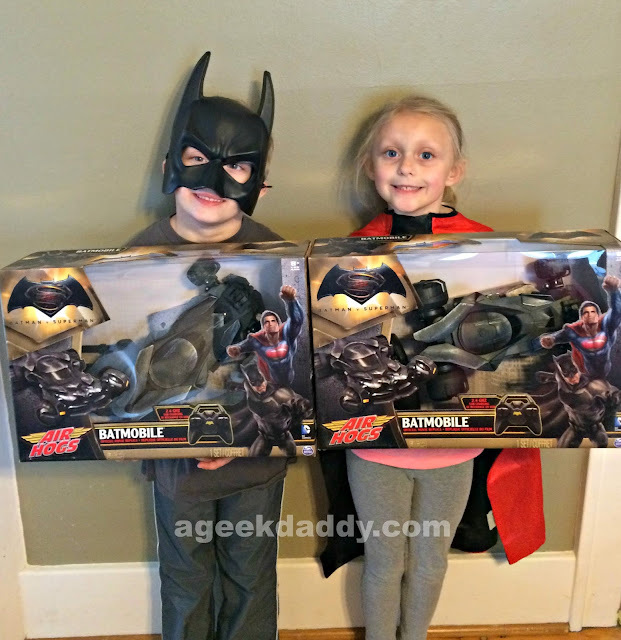 Of course we want to share our enjoyment of this toy with our A Geek Daddy fans so I'm pleased to note that not only did Spin Master send us an AIR HOGS Batman V Superman: Dawn of Justice Official Movie Replica Remote Control Batmobile to review for this blog but they also provided one for us to giveaway. Who wants to take the Batmobile out for an adventure?! To be eligible for this giveaway just follow @Geekdad248 on Twitter and retweet our original contest tweet which is embedded below before April 3, 2016 @ 11:59 pm EST. Must be a US resident over the age of 18 to participate. One entry per person and we'll randomly select someone from all eligible entries to receive an AIR HOGS Batman V Superman: Dawn of Justice Official Movie Replica Remote Control Batmobile courtesy of Spin Master Toys and A Geek Daddy Blog. Holy Pickled Herrings & Rhubarb Pie Batman this is an incredible giveaway! Don't hesitate to get your entry completed so you can hopefully be the lucky one who can tell all your friends "I'm Batman!" and show off your very own batmobile. 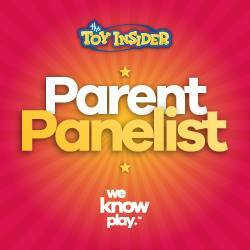 You can purchase this toy at Amazon, Toys R Us, Walmart or directly through the Spin Master online store. FTC DISCLOSURE / DISCLAIMER: A Geek Daddy Blog will be responsible for selecting the winner of this contest and providing for delivery of the prize by the U.S. Postal Service. By participating in this contest you waive any liability towards A Geek Daddy Blog or its publisher that may arise from your involvement with this promotion. Winner must be following the twitter account @Geekdad248 at the time winner is randomly drawn to be eligible and so he or she can be notified. Must reply to DM within 48 hours of notification or a new winner will be selected. Must be a US resident over 18 years old. Winner is subject to eligibility verification. It is a big package so no P.O. Boxes allowed. 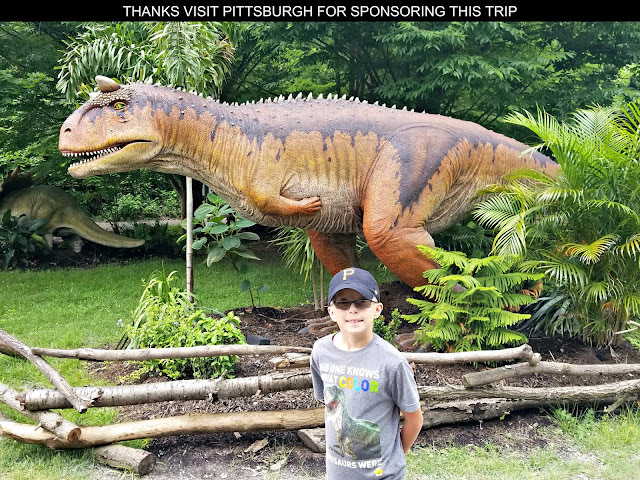 A Geek Daddy Blog did not receive any financial compensation but did receive for free the same item that is being awarded to one of our readers for this contest. A Geek Daddy Blog is hosting this contest as a benefit to our readers. Any opinions in this post are my own.